The Making of Medieval Derry - Ciarán J. Devlin will be launched at 7.30 p.m. on Wednesday 21 November 2018 in St Columb's College, Buncrana Road, Derry by Dr Éamonn Ó Ciardha, Senior Lecturer in History and Irish, Ulster University, Magee Campus. This new paperback edition features an extensive range of indexes that did not feature in the hardback edition. The two most important indexes are of personal names and surnames, and of names of places and population-groups. In addition, there are a bibliographical index of authors and sources, and a general index. Running to a total of some 3,500 items, these indexes should greatly help the reader to understand the story told by Ciarán Devlin. 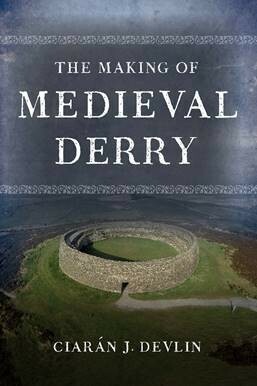 It is a book that is a tale of saints and sinners, of churchmen and warlords, of scholars and craftsmen, of Derry itself as sacred city, as frontier citadel, as royal capital and episcopal see. The reader will find here the record of a too-often forgotten past.